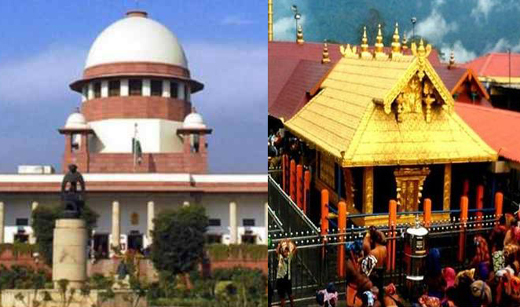 New Delhi, Nov 13: The Supreme Court on Tuesday agreed to hear the clutch 49 review petitions and all pending applications against its verdict allowing entry of women of all age groups into the Sabarimala temple. However, the five-judge bench, comprising of CJI Ranjan Gogoi and Justices Rohinton Nariman, AM Khanwilkar, DY Chandrachud and Indu Malhotra, clarified that there would be no stay on its September 28 verdict. “All the review petitions, along with all pending applications, will be heard in open court on January 22, 2019, before the appropriate bench. We make it clear that there is no stay of the judgment and order of this court dated September 28,” the apex court said. The SC decision comes just four days ahead of the temple opening for a two-month-long ‘mandalam-makaravilakku’ pilgrimage season on November 17. 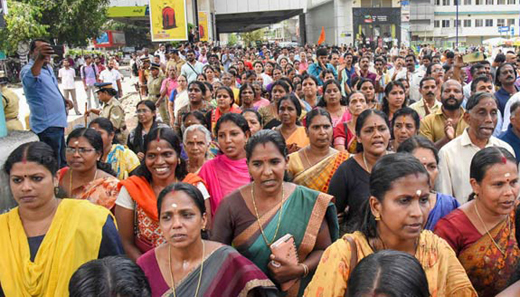 A total of 550 women in the age group of 10 to 50 are believed to have signed up for darshan through the online booking facility of the Kerala Police. Earlier in the day, a bench of CJI Gogoi and Justices Sanjay Kishan Kaul and KM Joseph deferred the hearing on fresh petitions, saying the writ pleas would be heard after it decided on the earlier petitions seeking a review of its judgment allowing entry of women of all age groups into the shrine in Kerala. These writ petitions are also likely to be tagged along with the review petitions. Kerala Chief Minister Pinarayi Vijayan said the government would discuss the matter with legal experts. “The SC has clearly said that its verdict allowing entry of women between age groups 10-50 yrs to Sabarimala temple stands. Review petitions will be heard on Jan 22, after the ‘Makaravilakku’ season ends on January 21. The government will discuss with legal experts and move forward,” ANI quoted Vijayan as saying. BJP state general secretary K Surendran, meanwhile, said the SC decision was an initial victory for Lord Ayappa devotees. “We are hopeful of overcoming the SC verdict when review petitions are heard. We will continue our fight till the end,” he said. Rahul Easwar, the activist who has been leading the Sabarimala protests and is president of the Ayyappa Dharma Sena, said his outfit would stand guard outside the temple till January 22, when the apex court will hear the review petitions. “The Kerala government must cooperate with pilgrims. Devotees will naturally react against any attempt to violate traditions. We will stand guard outside Sabarimala till January 22 when the SC hears the review petition,” he said. Congress leader K Sudhakaran said the apex court’s decision had instilled a sense of hope. “Decision of the Supreme Court to hear review petition in open court gives us hope, meanwhile we will continue our protests on Sabarimala,” he said. The top court had on October 9 declined an urgent hearing on the review plea filed by the National Ayyappa Devotees Association, which had contended that the five-judge Constitution bench’s verdict lifting the ban was “absolutely untenable and irrational”. The writ and review petitions were filed after the Supreme Court, in a 4:1 verdict, removed the restrictions on the entry of women of all ages to the Sabarimala temple, saying that the ban amounted to gender discrimination. It said the centuries-old custom at the shrine was not an essential religious practice and “the attribute of devotion to divinity cannot be subjected to the rigidity and stereotypes of gender”. Four of the five judges on the bench — then Chief Justice of India Dipak Misra, Justices R F Nariman, A M Khanwilkar and D Y Chandrachud — ruled against the restriction on women while Justice Indu Malhotra gave a dissenting opinion, saying “the religious practice of restricting the entry of women between the ages of 10 to 50 years is in pursuance of an ‘essential religious practice’… notions of rationality cannot be invoked in matters of religion by courts”. Review petitions have been filed by parties and impleaders to the original case, including the Nair Service Society, a community outfit; a representative of the Pandalam palace where Lord Ayyappa is believed to have been brought up; the chief priest of the temple; and, People for Dharma, an association of women devotees. The petition by the Pandalam palace said the age restriction on women is “based on and draw from the celibate nature… of the deity… and not on perceived notions of menstrual impurity as claimed by the Writ Petitioner”. The People for Dharma plea said the verdict had the effect of “Abrahamising the core of Hindu faith”. 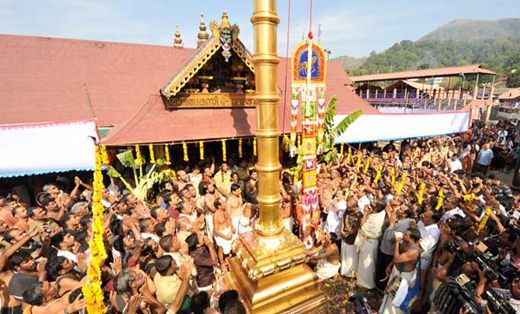 They argued that it was part of the country’s diversity as such a restriction existed only in this Ayyappa shrine and not in other shrines dedicated to the deity.